Whistling Straits Hole 1: The first hole might be the most visually inviting on the golf course, which isn't saying much as there are still plenty of bunkers and mounds on either side of the fairway. 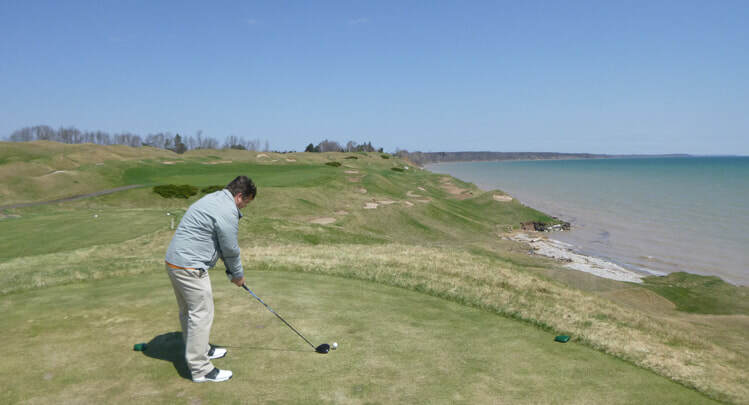 Nonetheless, the golfer should treat the opening golf hole as one of the best scoring chances on Whistling Straits. Whistling Straits Hole 3: The first par three of the day gives the golfer the first real chance to avoid going in Lake Michigan. The green is huge, meaning the shot can range by at least 3 clubs from front to back pins. Left is obviously bad, but getting held up right in the mounds or bunkers over there is no bargain either. Whistling Straits Hole 4: The Straits course really bares its teeth on this long par four, with a pretty tight fairway along the shores of Lake Michigan. Lots of mounding, bunkers, and a very well-guarded and undulating green means the player needs to be on from tee to green on this very tough hole. 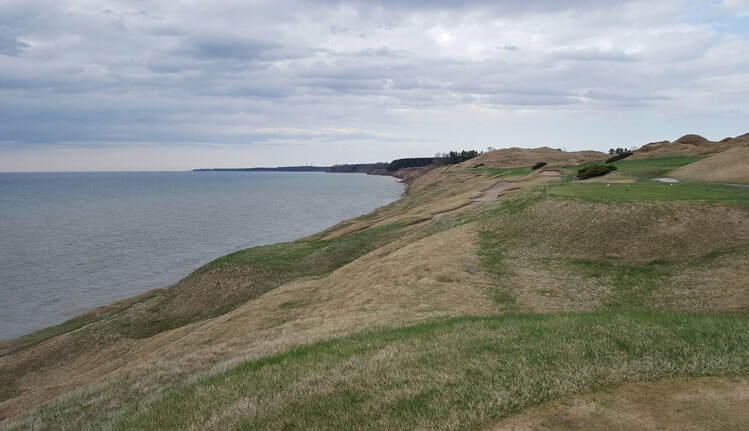 Whistling Straits Hole 5: The fifth is a special par five. Not only does this golf hole dogleg right over a lake and dunes and then back to the left over a different lake and wetlands, but it gives the golfer the option to bite off as much or as little of the dogleg as they choose, with the difficulty of one shot and the next one being directly impacted by the choice and successful (or not) execution of the prior decision. The green is more wide than deep and has a ridge in the middle making front pins much easier than those back of center that go away from the golfer. Whistling Straits Hole 6: On paper, this par four is the shortest on the front, but the visual lines off the tee are quite confusing, so golfer has to trust club selection and execution. The green is almost cut in half by a Pete Dye misogynistic sand trap (woe to the player who has to deal with the middle pin behind that bunker). Playing to the right pin is much easier from the right and vice versa. Of course, avoiding the central bunker is a must, so aggression off the tee can be rewarded through a much shorter iron to the precision-requiring green. 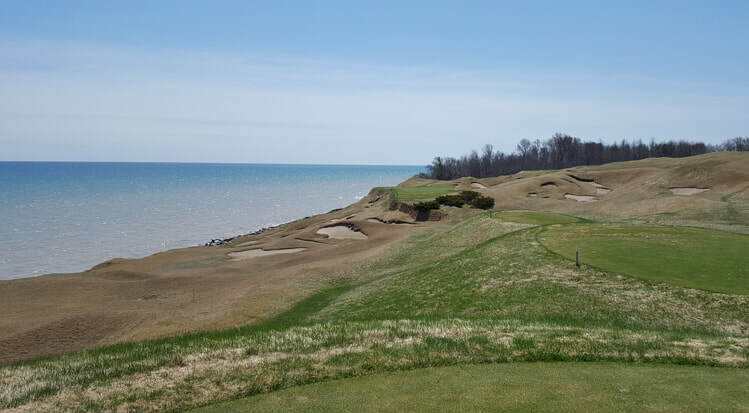 Whistling Straits Hole 7: This par three may give the most realistic chance of actually finding the WATERS of Lake Michigan on the golf course, and the hole is not short, requiring, for most golfers, a mid iron at a minimum. The entirety of the green is not more than 20 yards from that hazard. Going left of that will result in, almost certainly, a downhill chip of mounding or a sand shot towards the lake, which is beautiful, but treacherous. Whistling Straits Hole 8: In some ways, a mirror image of hole 4, this par four may actually be more difficult (assuming the same wind conditions). Playing a little uphill from the tee, a big shot is required, and cannot go right or it will find bunkers or side-hill lies next to the lake. The green is perched above the lake, is narrow, deep and well guarded on both sides by sand and mounding. Whistling Straits Hole 9: There are not many trees on Whistling Straits, but the 9th has one that could be troubling to the drive that goes right. A big drive is needed, however, as the green is sandwiched between bunkers and next to the creek that runs below its surface to the right about 10 yards, so accuracy (and caution) are needed. 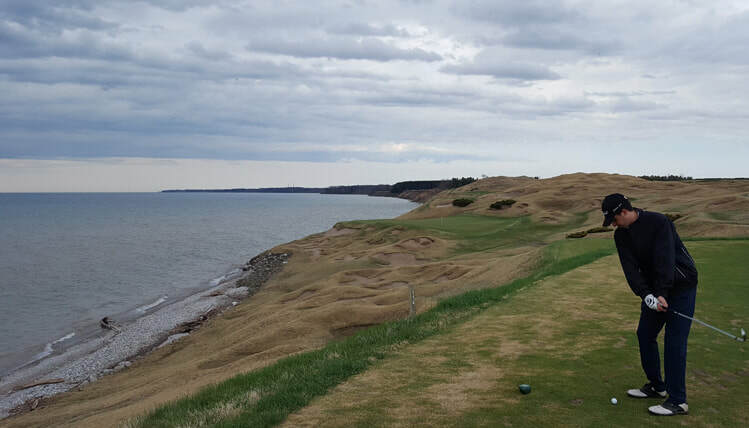 Whistling Straits Hole 11: The first par five on the back nine makes the golfer appreciate how much sand and earth Pete Dye moved around on the golf course. There are good views of the Lake and many other holes from here, and there is plenty of fairway to be hit and a green eventually, and the actual challenge is less than the visual one, but nowhere else on the golf course does the evidence of Pete Dye's earth moving strike such a chord. 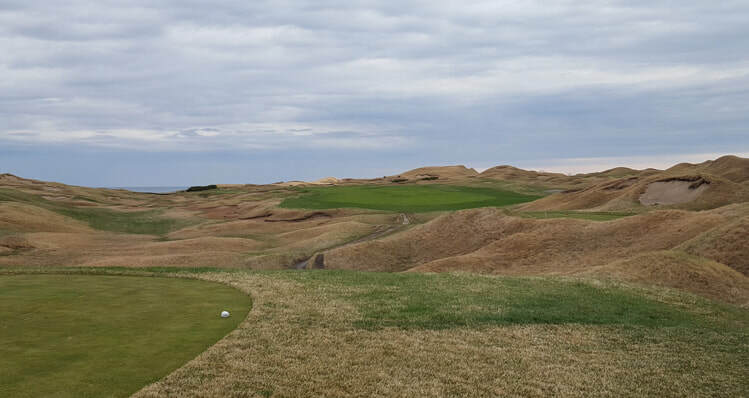 Whistling Straits Hole 12: This par three may have the greatest variance of difficulty based on pin placement of any on earth, and there is no hyperbole in that statement. Ranging from a wedge and relatively docile birdie opportunity that the front left pin provides, to a mid iron to the absolute nightmare pin placement that is back-right, this lake-side par three is quite unique in that facet. 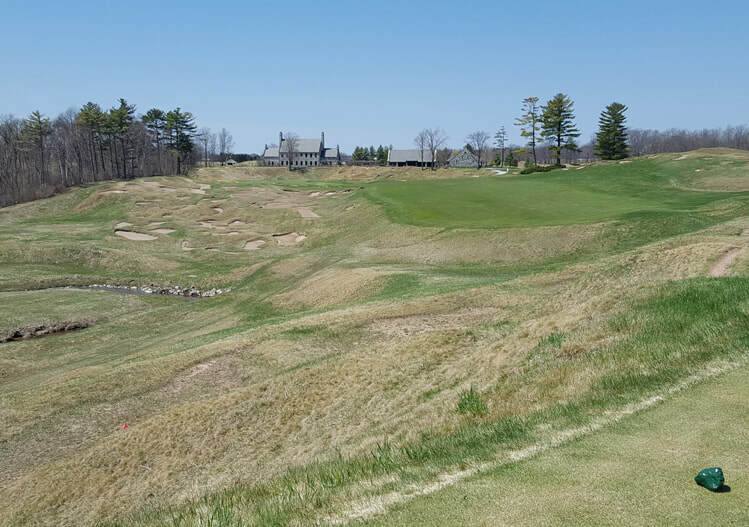 Whistling Straits Hole 13: This great par four is a slight dogleg right that does not play very long. However, hitting the fairway is key as the approach is downhill and towards the lake, so spin and control are arguably more important on this approach than on any other on the course. Whistling Straits Hole 15: Long and straight, this par four requires a couple of bombs to hit the green in regulation. 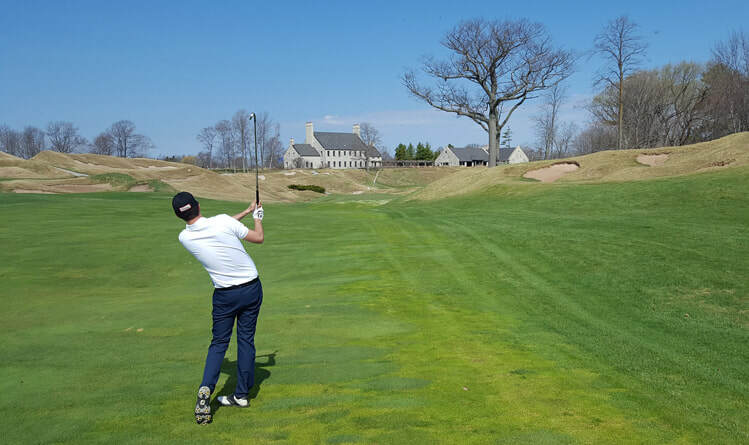 Deviating from the fairway can find bushes, bunkers or mounds that will make par quite tough. 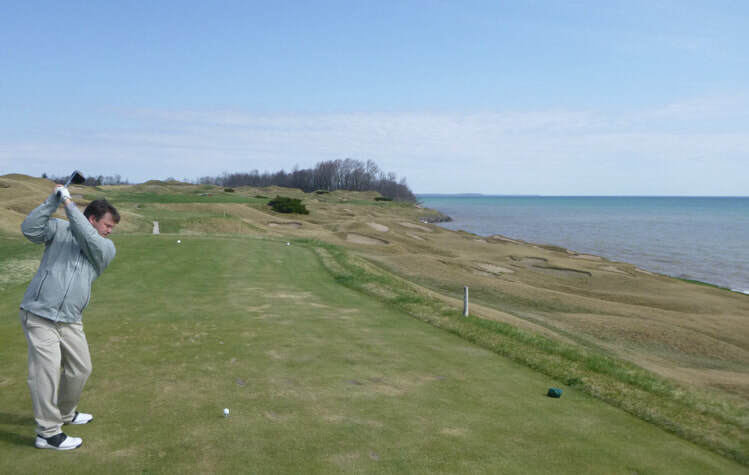 Whistling Straits Hole 16: This par five plays along the shores of the lake and, unless the drive is bombed straight, is played best as a full three-shot hole, as the green is surrounded by the usual trouble. Left from tee to green, as a general rule, is not a good idea. Whistling Straits Hole 17: The green here appears tiny and very tough to hit. The hole is long, there are railroad ties apparently holding the putting surface up and keeping it from falling into the like (appearances only) and going right will head towards a massive bunker/dune that is not friendly looking. Whistling Straits Hole 18: The final hole is a beast, pure and simple. Long, the drive must bit hit far, but can actually be hit too far if in the wrong direction. The green is like a massive, deadly four-leaf clover with trouble in every direction and hitting the wrong leaf can actually leave a putt that can't get near the hole.